Behind the studio, a small red oak tree is festooned with these! 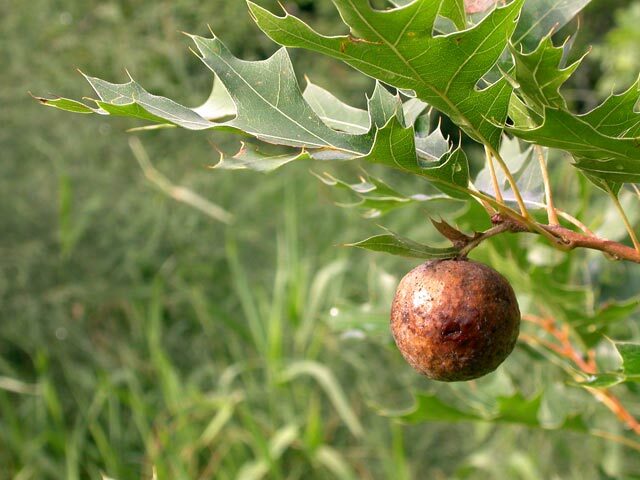 We have described uses for the oak gall in past topics, and I thought that I would open a topic devoted to its uses and hope for some good Q&A here. Now I am doubting myself, are oak galls used together with something else to make a stain? I do not know the uses for wood but for patinating iron and bronze a boiling decoct of oak gall in combination with fine iron filings or powdered rust is used. On iron it will give a nice warm gray to black and a dark brown on bronze. Unfortunately the achieved patina does not protect much the iron from rusting. Oak gall will color the metal when used alone but in my experience the layer is not very adherend. Does the gall need to be fresh, or should one collect and dry them? When might be the optimum time of the season to collect the galls? Should the insect be allowed to leave first? Do you cut, crush or just crack open the galls? Is there a suggested proportion of water to galls, and to metal filings or powdered rust? Is this a concoction that must be mixed fresh, or is there value in storing it for later use? Our pottery studio has iron oxide in powdered form for mixing with glazes to make brown to black influence on the glazed pottery. Would that be a type of powdered rust you referred to? Metals use: When used with metal is it a surface coloration only, that would be rinsed off with water, as you suggested above? A metals thread with the use of oak gall could be investigated on the metals forum, if we don't want to talk in depth about the intricacies here in the general materials forum. What would be used in concert with the oak gall, or other patination, to adhere the color to the metal? You posted while I was writing! I could harvest and share these galls. There are quite a few. I could freeze them first, to maybe kill the insect? Hmmm, acid etch mammoth briefly for opening the polished surface, to hold a gall produced color? I heard of using gall for ink, would that be a different preparation than Karl's description? my goodness... i would definitely harvest them... if they have lots of tannic acid... ! i know to buy small quantities of gallo tannate from fisher was quite pricey ! i was using it my self to etch the dendritic steels i make..... basically a dip into boiling dilute sulphuric acid...... then after wipe dry.... then rub on a solution of tannic acid and alcohol... and it would give a very dark pattern.... but i could only get a tannic acid made from grapes....... which you can get cheaply from those brew it your self wine places.....apparently people add it back into the wine they are making... but be warned.......it gives the iron a little bit purpleish tinge... as there are many kinds of tannic acid......... the gallo is suppose to be the darkest........ i haven't tried the pomegranate yet..
you ask very specific questions. I used this patination only twice. I used green gals (5-6) which I picked into pieces on circa 0,5 litre water. I dont know if there was still a little bug inside. First I tried them alone and was not happy with the result (see above). Then I added some iron fillings (not measured - maybe the half of a teaspoon). The second time I didnt had iron filings and I scraped the red rust off from an old iron sheet (again not measured) and it worked too. Just try the commercial iron oxide but it is chemicaly not the same as rust. Both times the solution became quite black while boiling. I didnt kept the solutions- no idea how long it could be stored. Hope it helps. How was the salmon with the broccoli? Karl, thank you for the description of what you did. The dinner was very tasty! It is fun when "he" cooks! The gall in the photo is no longer green, I would guess, but I think that it is not all the way dry yet. I will cut one today to find out. Thank you Greg description of how you used acid and the oak gall solution, and for the link to the iron/gall ink information. It is good to know how the ink worked on both vellum and paper, with the iron causing a halo and eventually destroying the paper over time. I wonder if the wood would be caused harm over time with a similar chemical solution? We have many Oak trees here in the yard, The Oak galls are large green and juicy right now. Never thought about useing them for anything! The wasp actually inserts genes into the oak tree and reprograms the trees genetics to grow the gall structure. Nature is amazing. I have found that just about anything from the oak tree can yield plenty of tannins. We have many very old oak trees that have died and fall apart slowly. These old trees have lots of burl nodes near the base. I found that boiling this node material will make a very potent solution. The burl itself is not very useful as a decorative wood. It is generally wormy. The oak galls I found yesterday are brown and dry. The little leaf parts growing from the gall tops make me think that they are from earlier this year, and not left over from last year. I boiled a broken up one in a quarter cup of water, and am letting it steep by itself. It shaded the water, but the proportion of water to gall is high with this little experiment. I have some info, which I will steer back to my comments on ebonization in the Rusting Question thread. (Meant to get to this earlier, but can't find my dang George Frank text.) Starting with the result, turning wood black, I have made a solution of rust (iron oxide) by soaking steel wool and/or rusty nails in vinegar (acetic acid). After a few weeks (depending on temperature) a cloudy, brownish solution forms, sometimes with a little foam. I filter this coarsely for the liquid and brush it on the wood surface. Depending on the tannic acid content, it will soon turn brownish black. The brown is probably excess iron oxide not absorbed into the wood. Wipe this off. You can let it dry and reapply, but usually 1 or 2 treatment suffice if tannic acid content is high. If the tannic acid content is low, as in maple or sapwood, I use a solution of gallic acid in distilled water First to infuse the wood. After treatments, light sand as water will raise the grain depending on the prep done beforehand. Reapply as needed after sanding, then seal and finish. I am sitting next to a koa/ebonized walnut hanging display case that is 15 years old with no problems. Now for a little chemistry. The steel added to the vinegar is actually converting to iron oxide as acetic acid is >90% H2O. Surface area of reaction is the goal. So starting with rusty nails is not a big advantage. The acid is actually a stripped down version of pyroligneous acid (acetic + methanol) used in the old days and by some industries today. The final reaction product desired is iron acetate, used by the dye industry. Here's where it gets squirrelly for me. Iron acetate is described as a mordant, or chemical fixative that reacts chemically with a second solution to fix color in the material. A mordant/dye combination should be an acid/base combination, or vice versa. Tannic/gallic acid (which is also described as a mordant ) makes this an acid/acid reaction. It might be that iron acetate becomes a lake, defined as a pigment of organic coloring matter with a metallic base or carrier. The relationship of your oak galls seems to be that they produce tannins which can be extracted as tannic acid powder. This powder can be further refined to produce gallic acid crystals. This is what I pick up at the chemical supply house. So what seems to be happening from ink to wood coloring is bringing together metallic pigments and a mordant to react when and where you need it. btw - How did you set up a link to a specific post? That BBcode thing? The "Show the link to this post" is pretty clever. Look at the upper right corner of the post you just wrote to me-- Post #9. Click that and copy the url that is provided. Paste it where you want to use it. Use the "Insert Link" option to place the url with a written descriptive phrase, as I did in the earlier post. I use household vinegar, although at 5X the concentration, the other solution will likely give you a stronger iron acetate. The aqueous content will probably still drive the intermediate iron oxide formation. My only concern would be that if all the acetic acid is not converted, it may transfer an acidic quality to the wood, which would be bad. A neat little experiment would be to make up a comparable solution of both, equal volumes, side by side. After reactions, take a couple of milliliters of each and, using baking soda to gauge neutralization by observing fizzing, try to determine acid content. Actually, pool Ph strips might be easier. If you try it, please let us know the results. Thanks for the tip on links. I'll get it one day. Good idea Karl! I used to have pool test strips, I'll have a look. If they are too out of date, it won't be hard to find them during the summer. Would the higher percentage acetic acid require a higher percentage of iron to be added? And would that higher iron respond to the lower water content in some way? More questions, but I should just go try it and find my own answers. Thanks for the lessons! Where do you think boxwood falls in the tannic acid content level? As long as you have solid material visible in the solution, there should be an excess of iron to react with the acid. You can always add more. I assume that you will use steel wool as it has the greatest surface area. Since the higher concentration acetic acid still has a 2:1 ratio of H20, there should be plenty of water to carry the reaction. Just do not forget to check acidity. This is at the limits of my knowledge. I think boxwood would be low in tannic acid content (purely a guess). I have found that lighter woods are usually low in content. Darker woods, nutwoods (oak, walnut), Leguminosae (like mahoganies, koa etc.) and the redwoods are high. Testing samples is the best way. Different concentrations of tannins will give shades from gray to black. I've got another week to go on two experiments. One jar has vinegar and 0000 steel wool, the other has about five galls boiled, with 0000 steel wood. Yucky looking stuff those jars contain! It mostly concerns the effect of ink on paper, but I think there's some good general chemistry, lore, and recipes included. Thanks for that link. Lots of information. The fact that the ink will eventually degrade the fibers over time may speak for not using it on wood. I have not read all of the information though. Historically such ink was a very important development for civilization. Just as a side note. I saw a show on PBS (I think) about the restoration project of the Declaration of Independence. It seems that the ink used was derived from oak gall. It's been used for writing since classical times. It has always been difficult getting pigment particle-based black ink to flow well from nib pens. The brush of Asian cultures and reed pen of the Middle East do a much better job at it. This is one reason why iron-gall ink had such a long period of use in the West. Once chemists figured out how to make black (or black looking) dyes around the start of the 20th century, iron-gall ink began being supplanted by these dye cocktails.